This is roving reporter Hugh Manatee, checking in with the latest from the Resort. 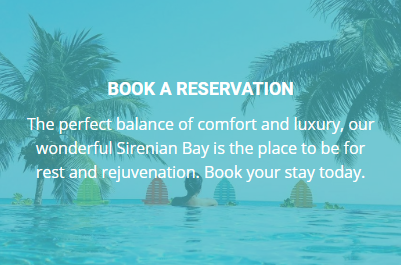 There’s no better way to get the scoop on life at Sirenian Bay than going straight to the source. Today your favorite manatee is giving you first look at an otterly exclusive interview with two of our amazing on-site hosts, David and Christy. Everyone who visits Sirenian Bay becomes part of the “family”. David and Christy, who have been married for three years and are local to Belize, feel as though the Resort is their home as well. Of course, Sirenian Bay is so beautiful that it’s hard not to feel at home there. With Christy’s amazing home cooking and David’s entertaining stories about Belizean history, it can be tempting to spend whole days relaxing at the Villas (this manatee certainly makes the most of it!). But there’s plenty to see just beyond its luxurious setting. Christy loves getting active with zip lining and water tubing, and can’t resist a day on the beach in Placencia. “It’s one of the most beautiful views in the area,” she says. After a day by the water, she loves to stop off at Mangos in Maya Beach – followed by gelato at Tutti Frutti. Of course, there’s no bringing up Tutti Frutti without a discussion of favorite flavors. “I love anything with chocolate, and there’s plenty to choose from!” she says. “Sunday is the only day they serve it, but Rum and Raisin is my favorite,” says David. I told you I’d give you an exclusive scoop, and I wasn’t kidding! Both flavors – and both of my favorite caretakers – get my whiskery seal of approval. Well, until next tide, this is Hugh Manatee signing off!